Two very important documents, if you have any for an ancestor during the American Civil War, would be their military pension file and any letters they wrote back home. The following is a good example of both in helping to tell the final days of one American, Wesley Wagoner in 1863. 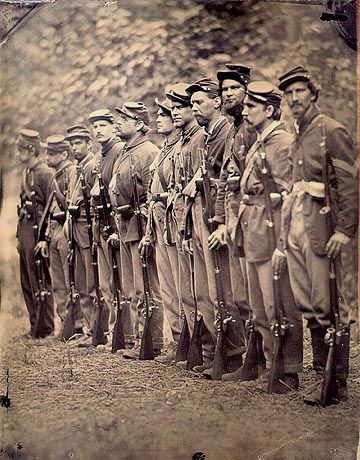 The 76th Pennsylvania infantry regiment along with four companies of the 7th Connecticut made an assault on Fort Wagner on July 10, 1863 but lost 187 men in the bloody fighting. 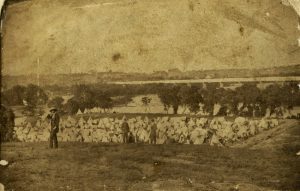 Wesley Wagoner, part of that regiment and from Hanover, PA, was taken as a prisoner by the Confederate forces on July 11, 1863 at Ft. Wagner, Harris Island, South Carolina. He was moved to Charlestown and then marched for weeks to Belle Isle Prison in Richmond, Virginia. The prison was on an island in the middle of the James River making escape very difficult. The entire compound consisted of approximately four acres but packed on that humid ground were 7,000 to 8,000 Union prisoners of war. It was classified a prison camp, the housing for the prisoners just being depleted and leaky tents. There were numerous times when countless prisoners were forced to sleep without any shelter, out in the open-air, even on the coldest nights. With freezing conditions, several prisoners were found in the morning in a frozen state. Conditions were very poor there, very little food, clean water or medicine. Food allowance for prisoners was a fourth-loaf of corn bread for breakfast, then a half-load at night along with half a pint of black beans. 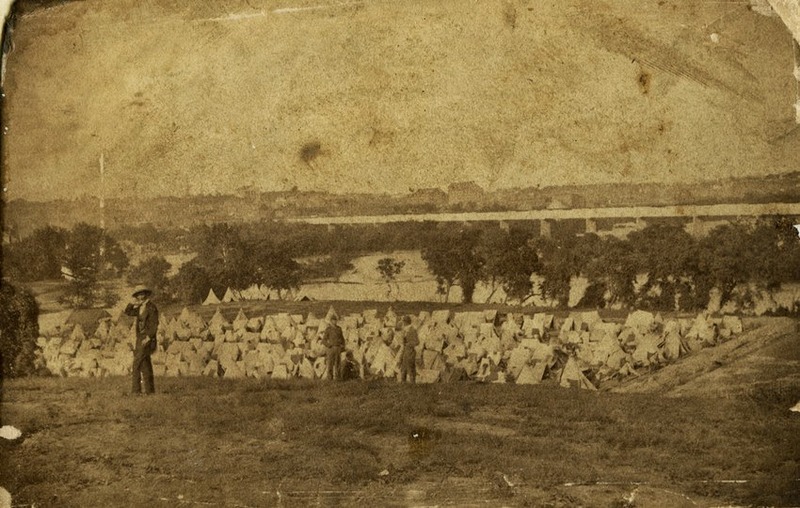 There were few supplies for the Confederate forces so little or nothing was left for the Union prisoners. Even the Union express boxes, with additional rations, rarely reached the prisoners; instead Confederate guards confiscated them. For months Wesley saw death all around him as fellow prisoners died from previous wounds that were not properly treated, or death from disease and lack of food. Even those who entered in the prime of life and in good health quickly succumbed to the horrors of this death camp. In early November of 1863 Wesley had a fever and was suffering from disease. When a prisoner appeared to have no chance of survival he was moved on November 10th to a hospital in Silkmound, General Hospital #21 in Richmond. A friend, Edwin Armstrong, from 2nd Regt., New York Cavalry, Co. “E”, was with Wesley in his final days. His fever worsened and “was out of his head” as stated by Edwin Armstrong who stayed by Wesley’s bedside. Wesley died a Sunday morning, November 15, 1863. Wesley Wagoner was barely 20 years old. Edwin wrote on November 20, 1863 to Wesley’s father, John George Wagoner, of Wesley’s dying days. Surgeon John Wilkins (CSA) certified Wesley died of pneumonia and dysentery (in Wagoner’s military records). So many prisoners died each day that their bodies were just put into a common grave by the Confederacy. Wesley’s father tried to have his son’s body returned to Hanover but without any success. 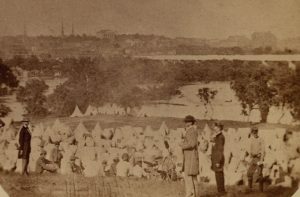 By February of 1864 most of the surviving prisoners were moved to Andersonville Prison in Georgia. 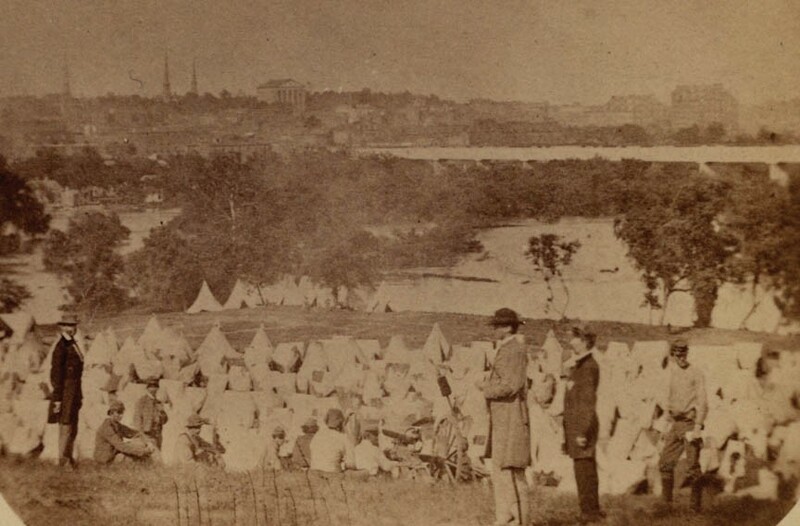 The Confederates were afraid of a Union attack on Richmond and the freeing of the Union prisoners at Belle Isle. Wesley’s father, John George Wagoner, in just a few short years lost his first wife and four children. His death came in March of 1865 at the age of 43. Now his widow, Anne, had only memories of a family that no longer existed due to disease, heartbreak and the cruelties of war. Wesley’s letters home were saved and cherished over the decades and passed on to family members. These few sheets of paper became his only legacy, including the letter from Edwin Armstrong. Military and pension files on Wesley Wagoner were done by the U.S. Federal government and would serve as well of Wesley’s letters to later generations to know about this young man in his final days during the Civil War. 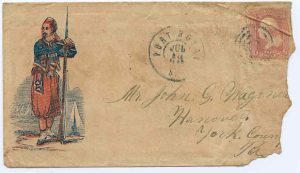 Photos: Union Civil War soldiers; Envelope from Wesley Wagoner; and photos of Belle Isle prison.